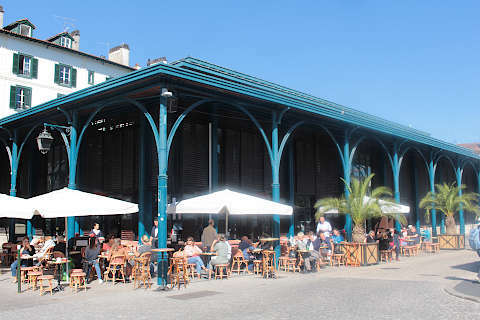 The town of Bayonne is six kilometres from the Atlantic Ocean, close to the eastern Pyrenees and just north of Biarritz: the towns here are so close and the region so developed that the three towns of Biarritz, Bayonne and Anglet almost merge into each other. 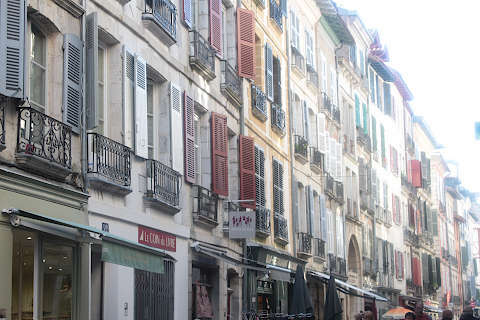 The town centre in Bayonne is also now classed as one of the protected French Historic Towns. 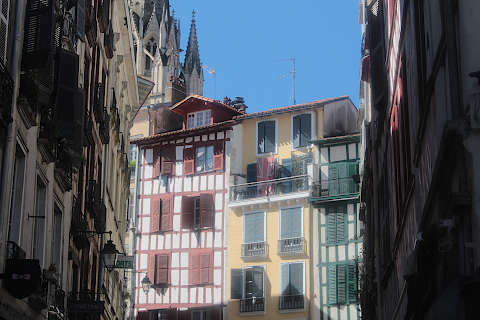 The main thing to do in Bayonne is just to walk around through the old town’s narrow streets and soak up the atmosphere. 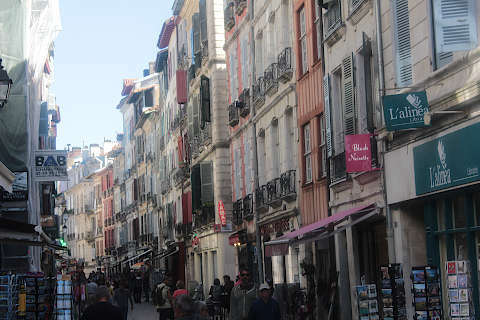 The shops are interesting and there is an abundance of nice looking restaurants, bars and cafes. The river frontage, the old town and the cathedral are the principal highlights of a visit. Two rivers divide the town into discrete sections. The river Nive flows south to north and separates Grand Bayonne from Petit Bayonne, and the River Adour flows east to west and separates these two parts of historic Bayonne from Saint Bayonne to the north. The confluence of the rivers is in the centre of the town, and most places of interest are to the south of the Adour rievr. 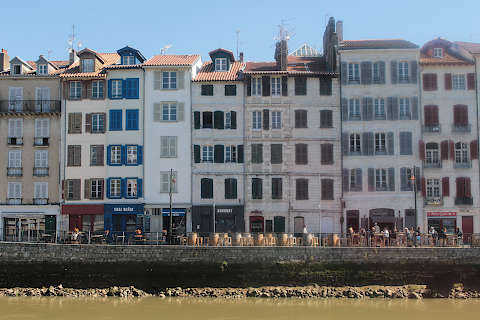 The river Nive is quite a narrow river as it crosses the historic centre and there are a total of five bridges that connect Grand Bayonne and Petit Bayonne. 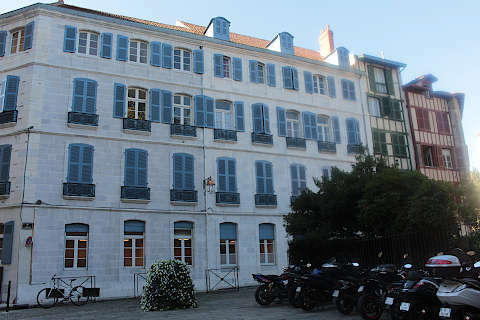 The main historical sights, including the cathedral and the Chateau Vieux, the fortifications and the botanic gardens, are in Grand Bayonne. 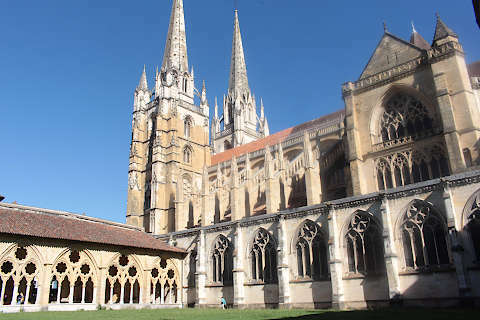 The gothic cathedral of Sainte Marie, built on the site of a roman cathedral that was destroyed by a fire, was largely built in the 13th century but later additions were added up until the 19th century. 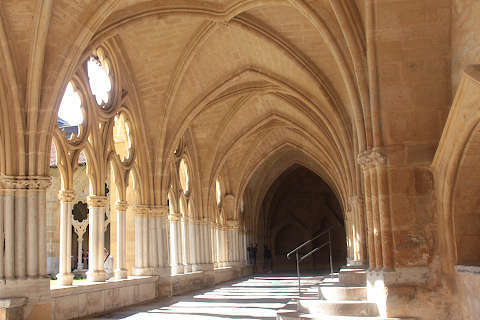 Next to the cathedral the gothic style cloister was built in the 18th century. Inside the cathedral there are lots of interesting things to see, but the highlight is the newly renovated area behind the altar, with its magnificent wall paintings and painted ceiling. 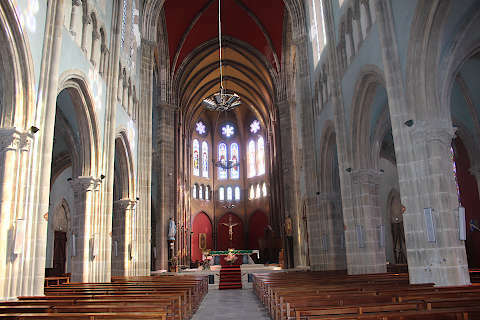 See guide to Bayonne cathedral. 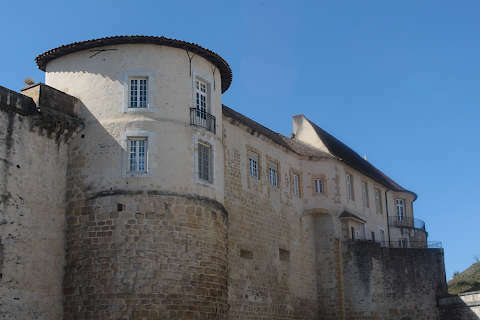 Close to the cathedral is the Chateau Vieux, where the governors of the city, including the Black Prince, were once based. This is now the property of the army and cannot be visited, although you can walk around the exterior of the castle (this part of the town has alse been renovated recently). Behind the castle is one of several places in Bayonne where you can see the massive fortifications that surround the city. 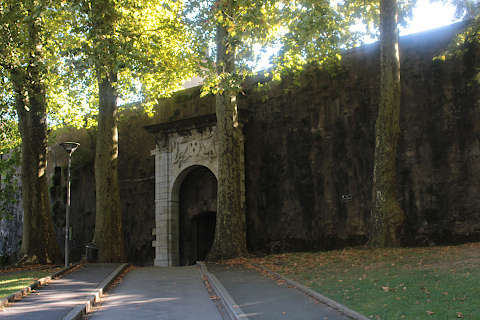 Another is to the south of the centre, where the Porte d'Espagne allows access through the walls. These fortifications date from several periods in the town's history, including Roman ramparts, ramparts from the time of Francois I (16th century) and ramparts designed by the famous Vauban (17th century) who designed many of the defences of French towns during his lifetime..
To one side of the castle you can take a stroll through the small Botanic Gardens, with hundreds of species and a distinctly Japanese theme. These gardens and others in the town are part of the reason for Bayonne holding the prestigious 4 flowers category of the ville et village fleurie competition, in recognition of the planting that has been carried out in the town. Near the confluence of the rivers you can see the Town Hall, a substantial building that was built in the classical style in 1842 and has statues along the facade, and also contains the town theatre. 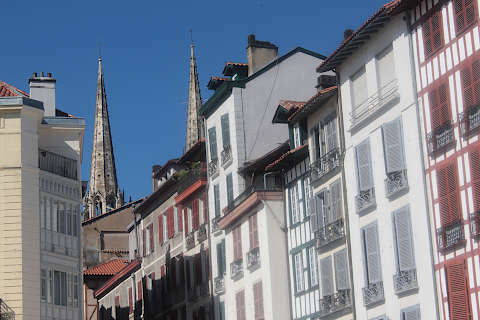 As well as these main monuments, you will certainly want to spend time exploring the historic centre of Bayonne, which is partly pedestrianised. 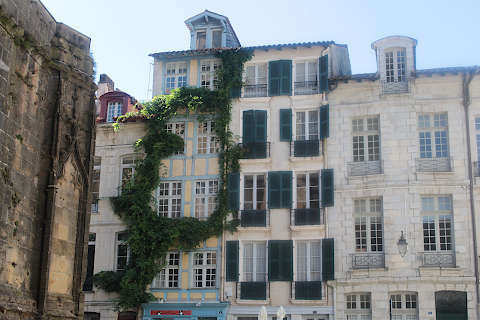 Among the streets there are numerous houses of historic interest: we suggest you ask for the town plan at the Bayonne Tourist Office (Place des Basques, to the west of the town centre) which has details of many of these houses, if you have the time to explore thoroughly. From here you can cross the river Nive to visit the Musée Basque. This is the biggest museum of Basque life and houses 2000 items and works of art commemorating Basque life. 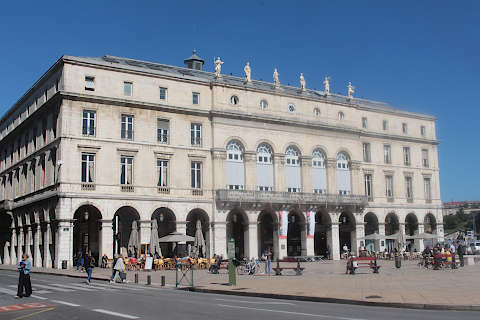 Another museum in this part of Bayonne is the Musee Bonnat which houses a large collection of paintings by Leon Bonnat as well as paintings by Rubens, le Greco, Goya and Degas. 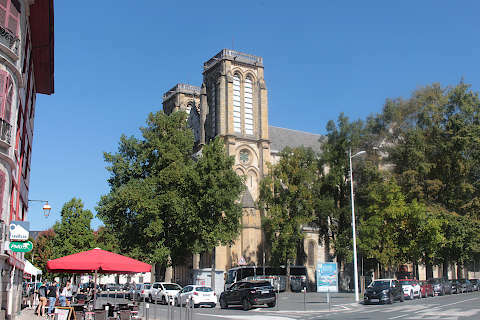 Another important church is also in this quarter of Bayonne, the Eglise Saint André. 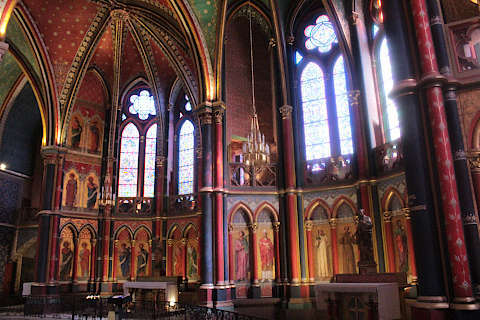 Less old than it appears, this neo-gothic church was built in the 19th century. 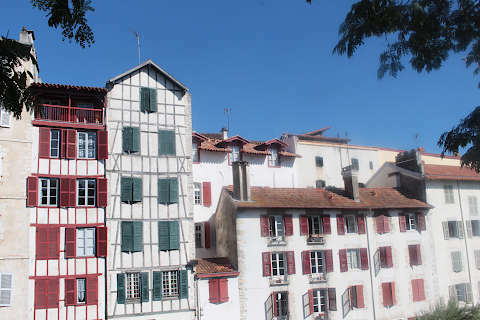 The part of Bayonne to the other side of the Adour river is less visited, but if you cross the Pont Saint-Esprit next to the Town Hall you get nice views along the river. 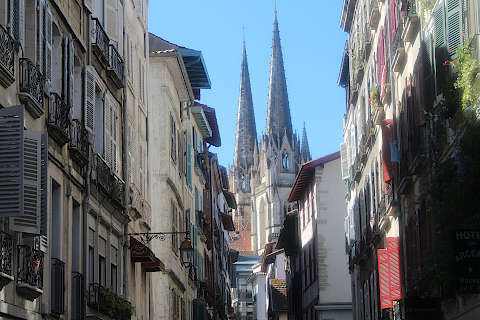 The main monument in this part of the town is the Church of Saint-Esprit, in a mix of roman and gothic styles and originally an important stopping place for pilgrims on their way to Santiago de Compostela. 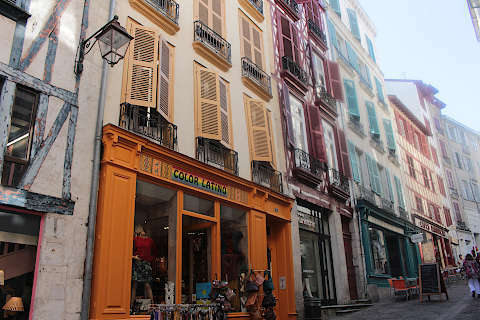 Any visit to Bayonne is likely to be part of a trip that also includes the lovely town of Biarritz, one of our favourite coastal resorts in France. You will also enjoy visiting nearby Anglet, both for the five kilometres of sandy beaches and the natural environment. A little further but you should visit the attractive resort of Saint-Jean-de-Luz, a lively town with a beach in the town centre.